Build and customize cities and neighborhoods with one click for your project. Optimized modeling and texturing for great looking cities and the fast renders. Add your own buildings to the rig. Customize the city including size, height, colors, windows, and lights to fit your project. Use the “Custom Areas” to add your own special buildings or objects into the scene. 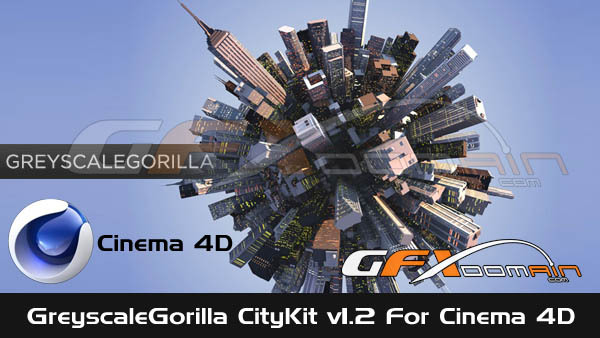 City Kit requires Cinema 4D version 11 and above, the Advanced Render Module (presets only) and the Mograph Module. If you’re running Cinema 4D Version 12. You need Broadcast Edition or Studio Edition. I can’t see the download links! plz upload!! That’s the link for the texture kit, and I have it, I want the CITY KIT :)! that aint right! wheres city kit 1.2? ?